Home » family » Happy Birthday Contract Son! Some 14 years ago, while sitting in my kitchen I day dreamed about gardening. I had an incredible urge to touch and feel my plants on my very last days of pregnancy. Unlike other days when I resisted, I could no longer hold my urge. So there I was, very engaged in my planting when my water broke. I experienced the most difficult childbirth known to me, and always wondered if it had anything to do with the baby's personality. Before M's teen years, he and I had contracts for everything, brushing teeth, changing clothes, and even eating! Crazy huh? It’s true, we lived this way for many years. Today is his Birthday! I am so proud we made it to his fourteenth Birthday with good health and a great relationship. He is the son who melts my heart with surprised tender moments. He is passionate, very intuitive, very strong will, and very smart. One day, he came up to me and started reading out loud one of my blog posts. I thought for sure he was going to make a joke, or laugh at it, but he smiled and said "I like it mom." There isn't a word to described the joy that I had because it was so amazing. It was as if watching a fruit tree bare fruit after so many years of not. We are still making contracts though it’s rare. The only one we currently have is for him to pull-up his grades in return for his XBOX, and I can’t wait for the day he show me his victory. My son, only a few of us are blessed with this challenge. Whether you remember or not, the Tangerine tree below is with us because you loved it and wanted me to plant it for you some six years ago. It has only begun to reward us with fruits the last two years, but we have already benefited in many ways. I raised four of my own. Aren't they marvelous? This is an inspiring post. Thanks! happy birthday to yr son. btw, the orange looks so tempting! Heartwarming post; great pictures! Happy Birthday to your son! he is one of my blog readers now, so I have to make it interesting is all. Just joking. What a wonderful tribute to your son. I hope he had a great birthday. I also hope he gets that XBox! thanks for the visit, he wants the XBOX too...so let's see if he is really serious. thank you Regina. the tangerines turned out brilliant. Great post! Happy birthday to your son! Can I have some of those Tangerines? thank you, yes you may...I still have some on the tree. Happy Birthday Matty! I still remember the day you were born. Tiny and adorable. Much love and will see you soon. yes, it's so fast...do what you can to slow down time for Tyler. 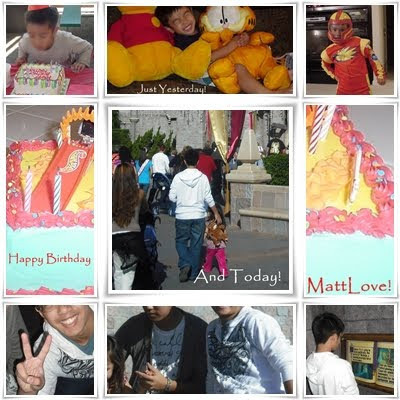 I try to be with MattLove, never know what we will get each day. Ah, what a sweet post. You seem to have a great relationship. I hope I will with my son when he's 14. I think you will have a good one with yours too. Happy Birthday contract son It isn't easy raising kids, but pays off in the end. I hope it pays off...for them. It's tough yes. I'm happy for you and Matt for having such a great relationship. Send those orange/tangerine my way, I'll eat them! I remember that tree well, as I've sit there many times..
With 5 children I can appreciate the sweetness of this post. Thanks for your visit, drop by anytime. Five sounds like a huge number compared to three, but I have 10 other brothers and sisters that I do not even see that often. Do doubt your son felt truly loved and honored you did this for him. They may not act like it, but they care. Wish I was there to pick me one of those tangerines. I love them. Thanks for your visit, but most of all for becoming one of my followers. I am sure you are right, love between family is a natural thing. So I hope he will realize this one day. you are so lucky to be able to grow them! what a wonderful plant! DragonFly Treasure, he even gave us some BD money back because he got mad at us. So all he received for his BD was this post from us. Troy, I probably will have to ask my customer for more Rosemary to see if I can grow some too. Thanks for the tips. Thank you. It is just like him, so be very sweet when he wants to be. Oh how sweet! Such a lovely post and such a sweet boy you have!! Happy Birthday to him! And your oranges look soooo good! !Have a great weekend! He has grown to be a really awesome boy since this post, and I am so happy for him and the world that will be waiting for him. I think the fact that a 14 year old son will talk to you, and not completely ignore you is a sign that you have done something right. What a fun post, and what an incredible tribute to a child, planting not just a tree in his honor, but one that will bear such colorful and desireable fruit. I hope his Birthday is a happy one, and just one of many, many more he enjoys. Thank you for visiting my blog. Rosemary can be grown from cuttings. It is not as easy to root as some plants, because it has a tougher stem, so I would use a rooting hormone on the cuttings to get them started, but it can be done successfully with a little patience. That is so sweet that you have such a great relationship. A blessing. And how do you plant and take care of the tree and fend off bugs and the likes?